Terrell Owens is the sixth player in NFL history to catch 1,000 passes. Owens reached the milestone with an 8-yard catch for Buffalo in the second quarter of Sunday’s game against the Atlanta Falcons. He had a 10-yard catch from Brian Brohm, making his first start, earlier in the drive. 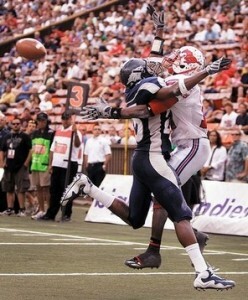 Owens entered the game needing two catches to reach 1,000 for his career, which began in 1996. He reached the milestone in 203 games. Only Marvin Harrison and Jerry Rice reached 1,000 career receptions in fewer games. As of the time I wrote this blog post, Falcon TE Tony Gonzalez has 996 career receptions. I remember when the NFL career reception record was a little over 600. That is the basis for the following trivia question. Who is the NFL player who has the highest yards per catch for a receiver with over 600 career receptions? The answer is below the fold. Answer- Don Maynard, who played in the NFL from 1958 to 1973 and was a favorite target of Joe Namath when both played for the New York Jets. Los Angeles Kings right wing Justin Williams broke his right leg early in the first period in a loss to Phoenix Coyotes on Saturday night. Coyotes defenseman Ed Jovanovski was spinning off a check of Kings center Anze Kopitar to hit Williams behind the Phoenix net when both players fell onto Williams. Williams fell backward with his right leg trapped underneath his torso, dropped onto his back and remained on the ice as play continued briefly in the Kings’ end. He was taken off by stretcher after a lengthy delay at 4:27 of the first period. Williams is the Kings 4th leading point scorer. His injury will most certainly an effect on how Los Angeles plays and whether they can make the playoffs for the first time since the 2004-05 NHL Lockout. A Nevada linebacker who did not play in the Sheraton Hawaii Bowl after he was dismissed by the team had been arrested days earlier on suspicion of shoplifting. Honolulu police say Andre Davis was detained this week by security at a Waikiki store before he was turned over to authorities. Nevada coach Chris Ault said Wednesday that Davis had been dismissed from the program for violating team and athletic department policy although he did not disclose the exact violation. Davis apologized to his team and family in an interview with Hawaii’s KGMB-KHNL news station Wednesday after posting bail. Whomever the AP hack writer who did this article, gives the distinct impression that the reason for Davis arrest wasn’t known at least to the wire service till Christmas day. That is when this article was originated. Unless AP’s Honolulu office had no one working since December 23rd, I’m not buying they didn’t know of the arrest of Andre Davis. As the article above states, the player appeared on television on December 24th. During ESPN’s broadcast of the Hawaii Bowl, announcers made at least one mention of Davis’ arrest. That’s how I knew about it. Also the Honolulu Advertiser, one of Oahu’s two major newspapers, had the news no later than Wednesday afternoon. I’ll also point out that AP regularly copies(or someone less critical would rewrites) the work of local reporters and then puts it out as the work of the wire service. Here’s just one example of AP doing just that, and getting the facts wrong in the process. Based on that Associated Press had to know the real reason for Davis’ dismissal by Nevada. The San Diego Chargers have their first-round bye, and Philip Rivers is still perfect in December. 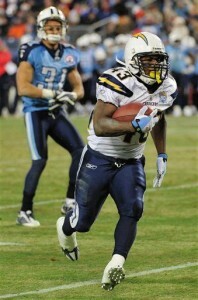 Rivers threw two touchdowns passes, LaDainian Tomlinson ran for two scores and the Chargers beat the Titans 42-17 on Friday night to grab the AFC’s No. 2 seed and that first-round bye in the playoffs. Darren Sproles caught a TD pass and ran for two more scores to help San Diego (12-3) squash the Titans’ dreams of becoming the NFL’s first team to start 0-6 and rebound to make the playoffs. Tennessee (7-8) had hoped to top what the 1994 Chargers did in reaching the postseason after an 0-4 start. The Titans had an incredible turnaround this year. You have to give them credit for that, the team didn’t give up which could have been so easy to do. Last night’s game didn’t clear up the AFC picture much. San Diego and Indianapolis are guaranteed byes and Tennessee is out of the picture. Things that did remain the same Cincinnati and New England can lock up division titles with just a win. Denver and Baltimore have the inside track for wild card spots. The New York Jets, Jacksonville, Miami, Pittsburgh and Houston all need help. I predict Denver and Baltimore will hold on to the spots they have now. “I actually feel sorry for people who have nothing to do on Christmas Day other than watch an NBA game,” the Orlando Magic coach said. While I don’t feel sorry for them, I do think there are better ways of using one’s time. The Celtics won that game 86-77. Van Gundy said he understands the high-priced TV contracts generate money for the league and it would be difficult to stop such games. He said he wishes the league at the very least had fewer games on the holidays. The people who could put a stop to these games or at least limit them, are the NBA players themselves. They could make it a request when negotiations for the next collective bargaining agreement comes up. During Wednesday night’s Florida Panthers game, the topic of why the NHL doesn’t play on Christmas came up. Announcer Billy Lindsay said it was due to the CBA between hockey owners and players. The Magic play games on Thanksgiving, Christmas and New Year’s Day this season. 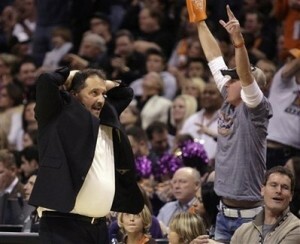 I can understand why Van Gundy is grumbling then. That’s certainly untrue. There is time with family, going to church, writing blog posts, and paying a visit to the cemetery where your son and parents are buried that are all much more important priorities in life. Van Gundy’s outspokeness may well earn him a fine. Bostion Coach Doc Rivers didn’t agree with the Orlando Magic coach. Rivers said it’s tough for players to be away from family, but he realizes the league is not going to stop playing on the holidays. Rivers lives in the Orlando area and was able to wake up Christmas morning in his own bed. As we grow up things that we once longed to do, have instead looked upon as a hassle. It’s part of life. The Washington Nationals have signed Matt Capps to a one-year contract to be their closer for 2010, his agent said late Wednesday. The deal is for $3.5 million for 2010, with a chance to make another $425,000 in performance bonuses. The performance incentives kick in at 40-65 games finished. The deal went down to the end between the Chicago Cubs, New York Mets and Washington, Capps’ agent, Paul Kinzer, said. The Mets were a late entry into the Capps pursuit, offering a similar contract to what Capps signed for with Washington. 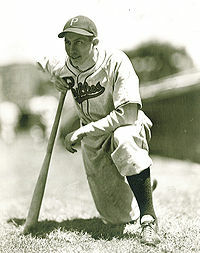 The only previous MLB team Capps has played for is Pittsburgh. He has plenty of experience pitching for a bad baseball team. Capps who saved 66 games and been a good reliever from 2006-08, had a sore arm for much of 2009. A one year contract is a small gamble. I just don’t see the Nationals turning around any time soon. Twenty-five years after its last bowl appearance, Southern Methodist made sure that it would be ready for the Sheraton Hawai’i Bowl. Led by an 18-year-old quarterback and a stout defense, the Mustangs cruised to a 45-10 trouncing of Nevada before a crowd of 20,217 at Aloha Stadium yesterday, leaving little doubt that SMU has returned from the dead. After receiving the “death penalty” from the NCAA in 1986, SMU football â€” a program that had produced the likes of Doak Walker, Don Meredith and Eric Dickerson â€” disappeared for the next two seasons. The Mustangs’ fall from grace continued with one losing season after another, until this year. SMU (8-5), which saw the best turnaround in the NCAA this year from a 1-11 2008, put the cap on a record season with a decisive victory over the Wolf Pack (8-5). The Mustangs’ last bowl prior to last night was the 1984 Aloha Bowl, when they beat Notre Dame, 27-20. This game was but over very early on. My wife, mother-in-law, and I left for midnight mass(10 p.m. at our parish) at 8:30. As we left the house, SMU was up 14-0 already and they were lining up for a field goal. Part of the reason for Nevada’s poor performance may be attributable to their defense being without two starters. One player had been arrested in the days leading up to the game. The comeback of SMU is one of the least noticed college football stories of 2009. We’ll have to see if June Jones can sustain this success. Trail Blazers center Joel Przybilla had surgery Thursday to repair his ruptured right patella tendon. Przybilla is expected to miss the rest of the season after hurting his leg during Portland’s 85-81 victory at Dallas on Tuesday night. He went up for a rebound and came down awkwardly with 3:12 left in the first quarter. Przybilla averaged 4.1 points, 7.9 rebounds and 1.4 blocks in 30 games. The Blazers have been beset by so many injuries this season that the NBA granted the team an exemption to carry 16 players on its roster. Portland also is without center Greg Oden (left knee), forwards Nicolas Batum (shoulder), Travis Outlaw (left foot) and Rudy Fernandez (back), and rookies Patrick Mills (right foot) and Jeff Pendergraph (hip). Another starter, Brandon Roy, has a strained shoulder.